Back in the days when all of us little girls were read Cinderella over and over many times, shoe size was a marker for femininity. Small feet were considered dainty and especially feminine. I remember wondering what it might be like to have a tiny foot simply slide right into a beautiful glass slipper, have a prince fall in love with me because of that, and better yet than even the prince–be able to walk in such slippers. While anyone who’s spent a day standing in high heels knows this is an impossible dream, as a little girl with cerebral palsy I felt that impossibility acutely. Not only could I not walk unless my feet were supported by the oxfords I had to wear, one attached to my the brace on my right leg, but my feet were not the same size. The right one, though more dainty in smallness by about 2 1/2 sizes, was weak and would not point without turning sharply inward. The easy slip into any kind of shoes was beyond me. It was more like having to find a way to stuff it in. My mother believed in good shoes for me, which, thank goodness, helped me learn to walk. We spent many hours in fine shoe stores that sold Stride Rite shoes for children, measuring my feet and hoping that as I grew, the right one would also grow. She never complained about buying me the two pairs it took to keep me walking safely and spared no cost. When the shoe section at Rhodes Department store offered us half off on that second pair, we began buying all my shoes there until I graduated from high school, or the store closed. Happily, enough growing occurred that by the time I was 10, my feet were a size and a half apart, and the orthopedist thought that my heel cord had stretched enough that it was now only necessary for me to wear my brace at night. This meant that I could now shop for sneakers. In those days that meant soft canvas shoes made by Keds, P.F. Flyers and Red Ball Jets. I hoped against hope that now, I, too, would be able to jump and fly through the air in new, soft shoes, just like the happy children in the commercials on TV did so easily. I don’t remember flying through the air, but I do remember the soft texture, and how happy I was one Spring day in the park to feel the grass against my feet in such shoes. While it was a positive thing for my right foot to stretch and become larger, it was also hoped my left foot would not become much bigger. And my mother would bemoan the fact that her own foot size had spread during her pregnancies to a size 8. She felt that was kind of big. My largest foot was a 7, and she always hoped it would stay that way. As it turned out, they each spread about a half size during my own pregnancy. Many years later than that, by the time I began integrative manual therapy in the 90’s after the diagnosis of MS, the left was 7 1/2 and the right was a 6 or 6 1/2. My intergrative manual therapy practitioner had no protocol to treat the MS wtih specifically, but she knew many techniques to work with CP, and hoped my right foot would be able to catch up as a result. By the time I stopped going to manual therapy regularly, my feet were just a half size apart. Once I changed my diet to low fat whole plant foods and started feeling more energetic, I began to be able to walk more comfortably and for longer distances. When I got Romeo, the time I spent walking and the distances we went increased exponentially as time went on. And my feet spread again. Walking all over NE Portland last summer in my new Nike fly knit running shoes, I was sporting a size 8 on both feet. It is just a tad looser on the right, but not enough to require a smaller size, an extra sock, or an added heel pad. So when it began to rain and be cold, I wore my sneakers for long as I could. Then I switched to my hiking boots, which are also a size 8. They have breathable tops that are purportedly waterproof in the sense that they (mostly) wick the water away from my feet, but the meshing becomes wet and has to be dried off near the heater. 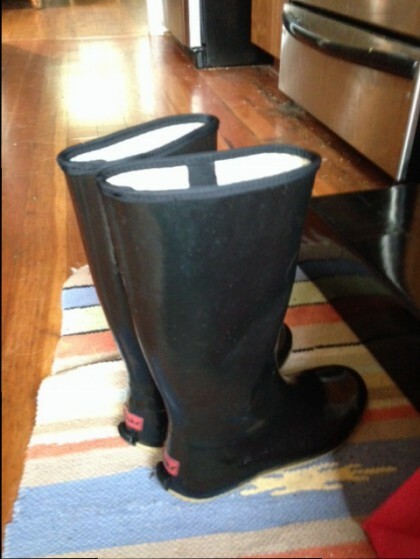 The rain boots I had purchased several years ago in a size 7 1/2 were now decidedly too small for my left foot. With record rainfall here in Portland, it was time to bite the bullet and go shopping for a pair of truly waterproof rainboots. And so it was that on a rainy evening in Portland I found myself entering the Lloyd Center with Mike and Romeo on a quest for said boots. As part of the Maggi family, I guess Mike was instinctively invoking what a dear friend back in grad school used to affectionately call “The Maggi Method.” It’s when you just go and see what there might be, without a very fixed idea in the mind about what you are looking for, but trusting you will know it when you see it. And so I followed Mike around, marveling at the huge shopping center, decorated with gigantic christmas ornaments suspended from the ceiling. We stopped to watch people ice skating below us on ground level, pirouetting and making figure eights. Then we decided, at his suggestion, to try Macy’s. Once I entered the shoe department, “The Maggi Method” kicked in. There were plenty of possibilities, but one in particular caught my eye. And then I saw it was available in solid black. They felt like slippers and they were completely waterproof. Both my feet fit comfortably in the last pair they had, which was, magically, a size 8. The lovely woman who carried out the stacks of boxes I asked for was an angel who offered me her holiday discount. So on top of everything else, I got a very good deal. The next day I tried them out on our morning walk and every time I stepped in a puddle I laughed out loud. I just couldn’t help it. Great traction, comfortable as slippers and dry feet! On further reflection I remembered that the first pair of matching size eights I purchased 4 or 5 years ago were my snow boots. At the time I thought it was because of the big socks I was wearing under them. But now that I have snow boots, hiking boots, running shoes and rain boots all in size 8, I think it’s time to say 8 is definitely my magic number, and that now there’s a good chance I will only have to buy one pair of shoes if I find the right pair. At least I’m willing to try that notion out. I don’t mind that my feet have gotten bigger. What’s most amazing is that after a lifetime, my right foot has nearly caught up to my left foot. It’s still smaller, still wants to turn inward, and the heel cord is still more tight than the left one. But oh, it’s magic to walk around in a single pair of shoes in the size that’s the same number as my birthday, and the number I used to call lucky when I was a little girl. Eight is the number connected to the planet Venus and all things we find beautiful. Thankfully, over my lifetime I’ve learned to broaden my notion of what is beautiful beyond the stereotypes handed out to me as a child. It it doesn’t often fit in a tiny glass slipper, and it’s definitely in the eye of the beholder. Since that evening and the morning after it, I’ve walked s few miles in those rain boots. Each time I remember the beauty of the city lights through the pouring rain, the smile on my son’s face when he saw how happy I was with the boots, and the Christmas gifts for others and food for our feast we were able to find that night. Sometimes good things come in small packages, as my Mom used to say. But sometimes they come in a big red and black box inside an even bigger bright red bag that says “Believe” on the outside of it. The universe has an uncanny sense of humor. These new boots in one “big” size 8 on my two feet have helped me think “outside the shoe box” of what I was taught to consider feminine, and in so doing they are two of the most beautiful things I’ve ever seen. Perhaps it’s not the boots themselves, but the freedom they give me from so many old ideas that held me in thrall for so much of my life. The number 8 is also shaped like the lemniscate, or infinity symbol. It reminds me that my healing journey goes on, without predetermined limits or regard to outside standards. I’m still learning to “try on” this belief, strange and different as it is from those I am conditioned to. Thanks, number 8, for helping me stick my toe in the proverbial water, once again. . .or. . wait a minute. . . maybe that’s thank you for helping me keep all my toes dry, all in one magical size. Another beautiful story Maria, tying your precious past memories with your present life experiences. I love all your words, but most importantly am inspired by your magical attitude. How fortunate you were to have had such a loving & caring mother! No doubt you were an amazing mother to Mike in turn, which is reflected in his delight when you are happy. Last but not least, how fabulous that your healthy diet & lifestyle has given you back the gift of mobility. So much better than any glass slipper in my mind!! Hello, love the post and cannot imagine the joy you must feel to buy matching boots – in Australia they are called “gum boots” and in the UK “Wellies” or Wellington boots. I also shop by a similar method as I find having fixed ideas when shopping often leads to disappointment. As always, Maria, this post is so full of wonderful ironies and echoes. I love and cherish the theme of accepting that the body seldom fits into the dainty and uniform molds of beauty that circulate popularly, and I so agree that the real beauty of human shapes is in their infinite individuality — as well as their capacity to shift and change over time. A huge part of my process in learning to love and accept my body has been recognition that it is ever-changing, and it will continue to change as I age. I also love the “Maggi method”! What a healthy way of looking at shopping, decision making, and so on. I’m glad that your patience rewarded you with new boots that are so right, and I hope they keep you warm this winter. Happy early New Year to you, friend. I also love the “Maggi method” – I sometimes shop like that, too! Now it has a name. Here’s to keeping warm and dry feet in this coming El Nino winter… Happy new year! I could feel your longing to have “normal” feet as a child, and I’m delighted that you’re happy with them now–and that you don’t have to buy two pairs of shoes! (Side note: Your mother sounds like she was completely amazing–what a blessing!) I’m also delighted that fate has bestowed upon you a lovely pair of rain boots for the winter and beyond. As someone who also has challenging feet, I know the feeling of elation that comes with finding shoes that really, truly fit! Oh, and an aside re: Cinderella: Can we all agree that a GLASS high-heeled shoe is the worst. plan. ever. Who comes up with this stuff?